This week I was made aware of something that I see happening all the time but usually don’t comment on it. Yes It was brought to my attention by a member that a Cammo suit sold on eBay last Sunday and was sent pictures. 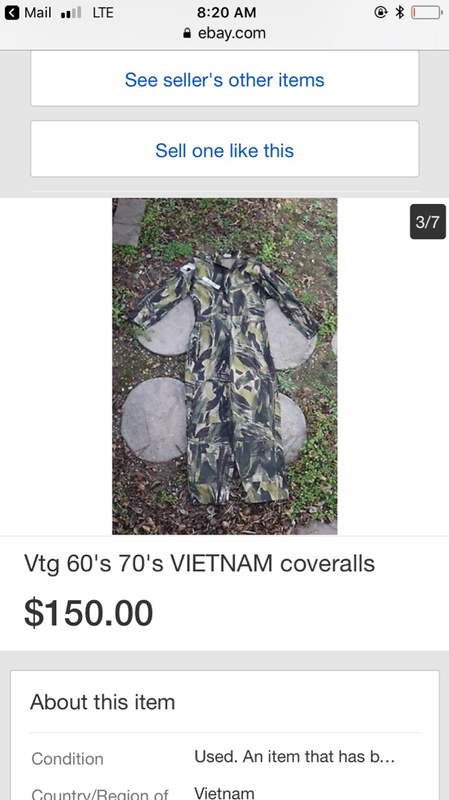 It was a nice nam Cammo suit. The seller sold it way below reasonable value. That was his name em deal no one made him do it. When something like this happens it’s interesting to see where an item will show up. Then hey presto it shows up 5 days later in the usmf sales page and the price being asked had climbed to $3500. Is it ethical to do this ? What makes you think it’s unethical? You said yourself that “the seller sold it way below ‘reasonable’ value.” Surely you don’t sell things for the same price that you paid, do you? Call it capitalism, Econ 101, or free market economy, that’s how the world works. I see nothing wrong here. But the "buy low - sell high" seems to work for the rest of the economy and it seems even more so with rarer stuff. The problem is more with the internet keeping track every time someone farts. As a wise man once told me "what I paid for it is irrelevant - do you want to buy it or not?" It is capitalism...some work harder...some work with more luck...some work smarter...but they work and are rewarded. Our commercial entity involving militaria makes and looses money like other businesses. The person buying and selling must add the morality and scruples. The person who bought this off Ebay educated himself where the seller never bothered, he paid the asking price.Fair deal no matter where he offers it up for sale and for whatever number he asks. Yes But I am questioning the ethics of it. Because he stands to make a large profit? Would you follow this business model Robert ? IMO there is too much thought into this. As said if I go and pick up something at the flea market or acquired legally and sold for any profit on this site for example - there is no issue. Captalism? You betcha!! Don't forget buy and sell can be for a loss as well..
Edited by chris3bs, 20 January 2019 - 09:54 AM. O...if you ask if I'm embarrassed about my manner of conducting business...absolutely not. This gentleman bought a BIN and now attempts to resale...would it be different if he sold to another dealer...collectible store...auction? I don't see anything unethical...I have undersold things before and the purchasers made money off my undervaluing the item. There is no ethics problem here. If you look hard enough and long enough, once in a while you find a good score and can make a profit. Good for him if he can get it. Hope I can have that kind of luck. Have you never found tiger stripes at a yard sale or rag mill for less than $20? Edited by KASTAUFFER, 20 January 2019 - 10:09 AM. This matter was brought to my attention by a moderator on USMF who had the feeling the Sales page was being abused by this type of glaring obvious profiteering. People in society today just need to relax a bit, and avoid jumping straight to the "I'M OFFENDED! THIS NEEDS TO BE BANNED!" button for every little thing. I think we are missing the nuance here guys. Yes you have a right to buy/sell as you wish. You also need to realize there's a reason people question our hobby and compare it to trading in baseball cards. There has to be a middle ground. Yes you have the right to party, but if you're getting someone pregnant every month people are going to question you on it. We've become to polarized. There is a middle ground here between having fun with the hobby and honoring these guys. Let's try and see that middle ground. I will say I picked up an original 5th special forces beret at a garage sale for 3 bucks, honestly I wasn't even sure what it was or what it could be worth. I had seen repops on ebay and didn't know if it was authentic or not and I put it on the forums Real or What section and had it authenticity verified. I sold it for $135 and while I had kept it in my collection for months I still made 45 times my money. From the response I got on it I think I sold it for a very fair price. Regardless of my profit margin I never felt like I was doing anything wrong, I just lucked out. I think line appears when one is willing to deceive a seller in order to get something you know full well is extremely valuable in order to get it dirt cheap. I don't believe you're dishonoring anybody or a memory by making a profit.The reason so many of these Military collectables survive is because of their monetary worth that coincides with the historical value. Putting something for sale from eBay to the sales stand at a massive markup in 5 days is telling the original seller he’s a dummy. Pretty in your face FU. I would agree that there is an unwritten rule in the militaria code that suggests that if you score something super cheap at show, it is bad form to turn around and reprice it and immediately put it on your table. Generally accepted practice is to save it for the next show or put it on your website, etc. That's more of a "decorum" issue than ethics....because the passage of time doesn't change anything for practical purposes. The original price was the same. The profit is the same. The only variable is the perception. Personally, most of the time I have better things to worry about. People can do what they want, as long as they are not ripping me off or abusing me, my wife, or my table helper.